“Be Gone, Fear” from Breanna Robinson, a Christian Faith Publishing author, encourages young readers to overcome the many fears they might face by choosing to have victory over through Christ. “Be Gone, Fear” is the creation of published author, Breanna Robinson, a young adult who leads part of the children’s ministry at C3 Church San Diego. She is passionate about building the church and building up the people who will truly change the world. Each experience in ministry, especially as a pastor’s child, has taught her the importance of making sure people know what their identity in Christ is and what exactly He has purposed them for. 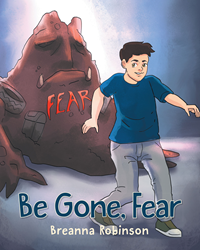 Published by Christian Faith Publishing, Breanna Robinson’s new book, “Be Gone, Fear” is a book that encourages children to overcome their fears and live their lives filled with courage. Children face many different kinds of fears as they grow up, yet few are ever taught how to achieve victory over them. View a synopsis of “Be Gone, Fear” on YouTube. Consumers can purchase “Be Gone, Fear” at traditional brick & mortar bookstores, or online at Amazon.com, Apple iTunes store, Kobo or Barnes and Noble. For additional information or inquiries about “Be Gone, Fear”, contact the Christian Faith Publishing media department at 866-554-0919.